Gary Kebbel, journalism program officer at the John S. and James L. Knight Foundation, was the guest speaker this week at the Berkman Center’s Luncheon Series. Kebbel’s presentation, entitled “The Knight News Challenge and Digital Innovation: Challenges Posed by Intellectual Property, International Giving, and Grant Administration” discussed the foundation’s grant program. Just ending its third year, the Knight News Challenge is a $25 million contest to find digital news innovations that are used to create community in a given geographic area. 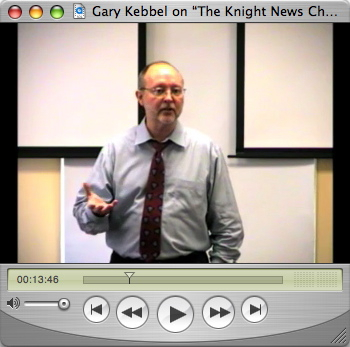 At Knight Foundation, Kebbel also helped create the Knight Citizen News Network and the Knight Digital Media Center. The contest was recently revised to meet new and evolving goals, such as making grants to individuals in foreign countries or focusing the wisdom of the crowd on weak applications so that they could be strengthened and resubmitted. Additionally, $500,000 was set aside for the ideas of people 25-years-old and younger. These changes create new problems of grant administration, intellectual property and having a minor win a monetary award.